The [marble] block, which is 90 centimeters in length and 116 centimeters in width, has revealed the use of water in the city had been managed by law, which involved a penalty ranging from 5,000 to 12,500 denarius. The “water law” marble block dating back to 114 A.D. [the time of the Roman Emperor Trajan] included strict measures regarding the use of water coming from the Karcı Mountain through channels to the city, as well as the use of a fountain dedicated to Roman Emperor Traianus. The rules were prepared by Anatolian State Governor Aulus Vicirius Matrialis.
. . . the Excavations head Professor Celal Şimşek of Pamukkale University, said, “The Laodicea Assembly made this law in 114 A.D. and presented it to a pro council in Ephesus for approval. Even without the translation of the new inscription, it certainly emphasizes the importance of Laodicea’s water system that is referred to in Revelation 15-16. 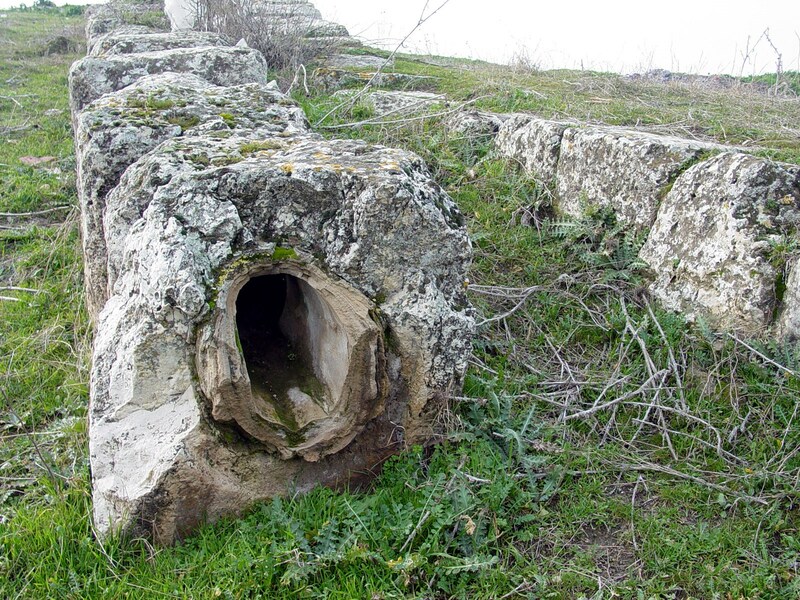 Some commentators thought that water was piped from the hot springs at Hierapolis 6 mi. to the north and that by the time the water arrived at Laodicea it was lukewarm. But no such water system has ever been found and modern scholarship, including the excavator of Laodicea Prof. Celal Şimşek, have rejected this theory. Laodicea received its water from springs to the south of it via an aqueduct and an inverted siphon system. The interior of one of the two pipes of the “inverted siphon” that was part of the system that brought fresh water to Laodicea from the south. The “water tower” is the massive clump of rock just left of the center of the image. View looking west. This water tower is located on the south side of Laodicea very close to the stadium and to the bath/gymnasium. Evidently water entered the city from the aqueduct coming from the south, was “pumped” up to this area, and into this structure This is actually a constructed structure – made out of individual blocks of stones and clay pipes. It seems that water was “pumped” up through the clay pipes and that it spilled out over the top, cascading down the sides of this structure — like a “bubbler.” The constant flow of water left behind calcium deposits and thus the amorphous – almost solid – appearance of the structure. For a view of the “interior” of the “water tower” Click Here. 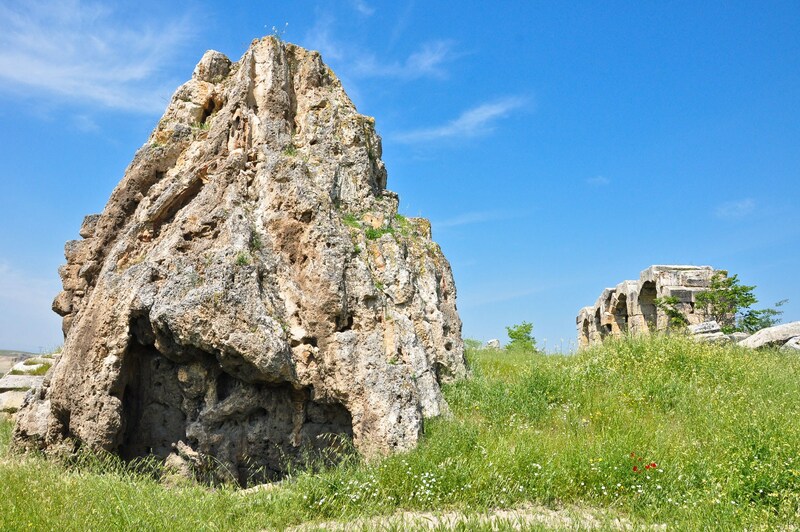 This entry was posted in Places in Turkey and tagged Celal Şimşek, Laodicea, Seven Churches, Water System. Bookmark the permalink. What explanation is best when countering false notions about the Laodicean’s spiritual state? Popular, yet uninformed, preachers have long stated: “God wants a person either “on fire” or ‘completely cold’ to God instead of somewhere ‘in-between’ these states. Bible students see this popular notion as unscriptural because its lacks confirmation from the whole message of the bible. It has been a while since I have had to counter this idea in those who only had a superficial understanding of God’s word. I have mentioned the hot springs as beneficial and the cold likewise instead of negation for cold as refutations. My question then: Can we get insight from the archaeology and history of Laodicia of this biblical reference?